I’ve been looking through my mess of newspaper cuttings on the Barangaroo development in Sydney’s Darling Harbour. Eight years’ worth, minus a couple of articles that my rabbit chewed during a period of accidental incarceration in the study - he's a survivor. My incomplete archive of newsprint doesn’t quite extend back to the original design competition in 2006 but it gives a pretty good outline of the extraordinary convolutions in this project. If anything gives credence to the clichés about the fundamental connect between Sydney development and big money, Barangaroo is it. Currently billionaire James Packer’s ‘unsolicited proposal’ for a 275 metre tall tower is being considered as Modification No. 8 - or just ‘Mod 8’ as it has become, shorthanded at the end of a growing list of alterations. The City of Sydney’s lengthy submission opposes the proposal in tight clear language that nonetheless conveys a sense of bewilderment at the ongoing ‘planning creep’ which has seen a hotel appear over the water (Mod 4), then disappear, then reappear in a much larger incarnation replete with casino and apartments – all encroaching upon public recreation space in the middle section of the project. Apparently this is part ‘concession’ to public complaints about a hotel built on the harbour and part ‘necessary’ adjustment for financial viability after the extraordinary push of the envelope four modifications earlier. Packer has long argued that a high end casino is essential if Sydney is to compete for the growing Chinese tourist dollar. And apartments in this tower are estimated to sell for up to $100 million – figures that might also tempt the new Asian oligarchs. Concept drawings show a glass shard that would be at home on the waterfronts of Hong Kong or the Middle East where the display of wealth and power has complete sanction. Packer’s interest is, we are to assume, equal to the national interest. There has been much talk about transparency throughout the planning of the place, but just how it came to this is still not clear to me. That is the unfinished story of built Barangaroo which occupies the middle and southern end of the precinct. The tale of the ‘headland park’ to the north, on the other hand, is mostly over - it opened to the public on 24th August this year. But that, too, has been a drama. The original winning entry from a group led by Philip Thalis back in 2006 began with the idea that the existing shoreline, which was then a flat apron of concrete built to accommodate shipping containers in the late 1960s, was to be respected as an erstwhile working waterfront. There was green space, some of it tiered, but this was obviously a modified angular landscape. The Thalis design was, however, superseded in both its landscaped and built elements in an opaque process that saw buildings get bigger and parkland rearranged, much to the disappointment of many. The Barangaroo Action Group was one manifestation of this discontent. It had formed by 2010 to protest the changes and encourage citizens to help ‘Stop the Plunder of Sydney Harbour’ by telling the Government to retain a plan for the place ‘in keeping with the originally approved concept’ (Sydney Morning Herald, 8-9 May 2010). It was design enthusiast and former Prime Minister, Paul Keating, who did most to alter the angular parkway so as to create a ‘naturalistic’ park. As Chair of the Barangaroo Design Excellence Review Panel that had apparently embraced the Thalis scheme, Keating nonetheless convinced the State Premier Morris Iemma to reinstate the headland that ‘man, through industrialisation, took away’ (Sydney Morning Herald, 9-10 August 2008). That was back in 2008. The new place was dubbed Barangaroo after the strong-willed Aboriginal woman described with rare clarity in colonial accounts; along with her husband Bennelong after whom the point which came to accommodate the Sydney Opera House was named. By intent or otherwise the two places were thereby related as dichotomous points on either side of Circular Quay – man/woman, husband/wife, culture/nature. Keating continued to guide the park design despite resigning from the Review Panel in May 2011, furious at criticisms about process and scale from Sydney Lord Mayor Clover Moore, whom he dismissed as the representative of ‘sandal-wearing muesli-chewing bike-riding pedestrians’ – self-evidently the most undeserving of constituencies (Sydney Morning Herald, 7 May 2011). Upon the opening of the park in 2015, Keating argued that the resulting park would not have been possible within the confines of the planning process. It took his vision and ‘horsepower’. For that single-mindedness the Herald dubbed him ‘The lord of Barangaroo’ (Sydney Morning Herald, 22-23 August 2015). Mr Keating is renowned for bold, and sometimes bizarre, hyperbole (by definition pedestrians don’t ride bikes). 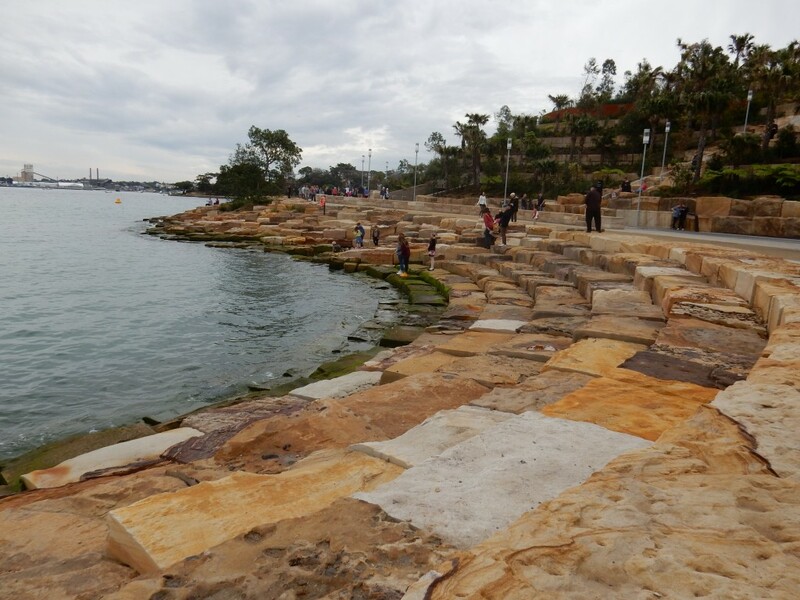 At the opening of park in August this year he reportedly claimed that the newly landscaped space would Sydney's best example of a harbour headland 'before European settlement’ (Sun Herald, 23 August 2015). Allowing for the gradual growth of the trees and shrubs at Barangaroo – it is currently quite a stark park - that is an extraordinary prophecy. Barangaroo will never match the thick Angophora forests of Bradleys Head and Berry Island (now joined to the mainland to create a headland). Even Balls Head, the oldest plantings on which only date back to the 1930s, is more indicative of the pre-colonial foreshore. 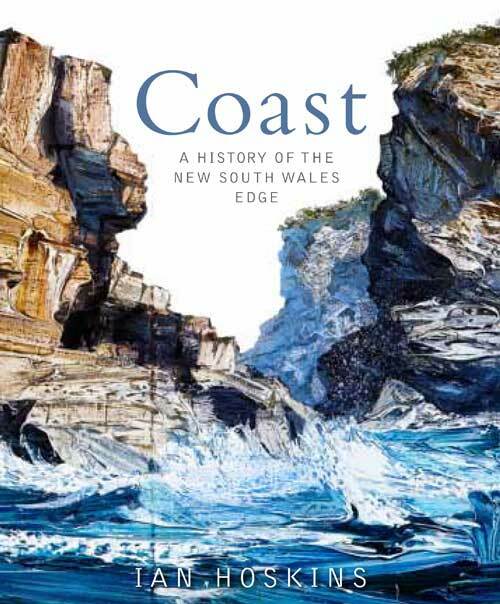 Though the jury seems to be out on the extent of Aboriginal burning - 'firestick farming' - around the Harbour, controlled burning at Balls Head and on Berry Island has approximated any pre-European landscape subjected to such a regime. The Reserve is, in fact, a highly structured landscape. It is obviously terraced and the foreshore is lined with square cut blocks of sandstone, albeit stone obtained from the site. The waterline of the Point does now look like the earliest charted foreshore but it is much less steep and the trees, a mix of eucalypts and figs, are not representative of the range or density of the original growth. To have replicated that would, of course, have compromised the all-important views. And then there is the curious inclusion of a formal grove of deciduous exotics near Hickson Road – what I took to be London Plane trees but which may be some of the North American Honey Locusts that have raised eyebrows among the horticultural community, not least because the plant is classified here as a weed. For a man who emerged from the political labour movement in Australia, Paul Keating has a curious dislike of industrial heritage. Had the site of Barangaroo retained a vestige of the early colonial Georgian architecture he admires, Keating’s desire for a natural headland might have been curbed. But the structures of the early 20th century have no place in his aesthetic view. Indeed, years ago Keating argued for the demolition of the Woolloomooloo finger wharf – something many regard as a beautiful combination of graceful form and function. As it is, the finger wharves of East Darling Harbour - today's Barangaroo - were demolished for the concrete container wharf of the early 1970s. The Maritime Services Board tower which sits atop the new park is all that is left of that era and, therefore, is slated for demolition – a particularly egregious eyesore in Keating’s estimation. When the tower goes Sydney Harbour will have lost yet another skyline element of its industrial/commercial heritage – one to follow the erstwhile hammer head crane at Garden Island. While there was probably no way to adapt that structure for other uses, the tower is reusable as a viewing platform – one with a far more organic connection to place than the truly ugly faux spinnaker lookout built on the waterfront at Portsmouth. It is contemporary with the Opera House and represents the last incarnation of an historic working harbour, just as the gleaming shells on Bennelong Point symbolise a post-industrial waterway. The area adjoining Barangaroo is already being emptied of its working class constituents as the government-owned terraced housing, originally built to accommodate waterside workers, is sold off. 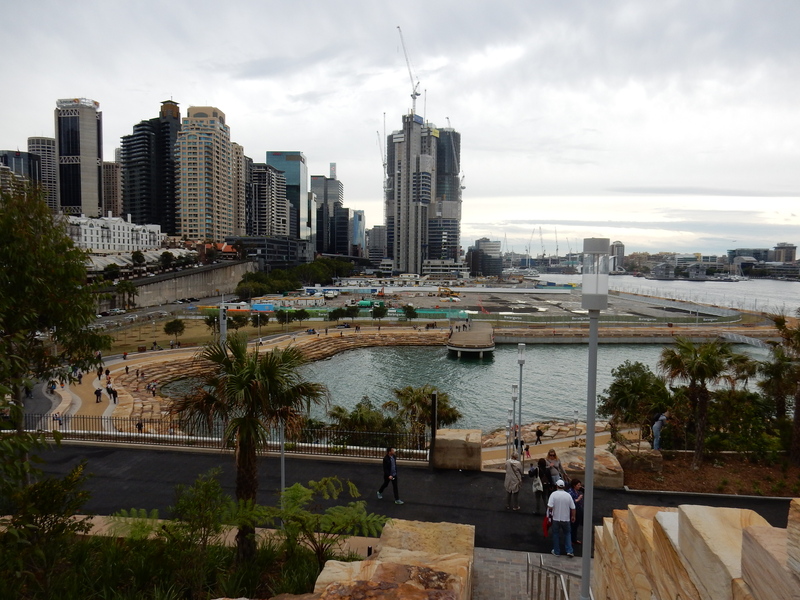 Of course the view from Barangaroo headland is wonderful – and free. However, the social context of the park is shifting. It certainly won't be the next hipster mecca implied by Mr Keating's characterisation of Clover and her muesli chomping, pedal pushing constituents. Time may prove me wrong but my suspicion is that it will be less a people’s park for the residents of a multi-layered city than a tourist resort and a running track for the bankers who will have bought the nearby terraces as boltholes. And when the two billion dollar tower is built on its southern edge, the park will also be the forecourt to another man’s vision, 'horsepower' and willingness to defy planning process. Packer's tower, rather than the 'naturalistic' headland, will be the obvious counterpoint to the Opera House on Bennelong Point: the latter a symbol of cultural aspiration, the former a temple to avarice both realised and hopeless. Australians are, we have just been told, the biggest gamblers in the world. The $20 minimum bet will still see a great many coming to try their luck at Barangaroo. What a profound statement. The view from Sydney's tallest building (the antennae of Centrepoint Tower is slightly taller) will be so much better than from the headland or even the old maritime tower but I doubt if the occupants will care much about the intricacies of park design or heritage. Then James Packer will be the real Lord of Barangaroo.